This interesting surname was introduced into Ireland by the Anglo-Norman invaders of 1169 and 1170. One branch of the family, initially called Barratt, settled in County Cork and their name was rendered "Baroid" in Irish. The second branch called Barrett established themselves in the Connacht counties of Mayo and Galway, where the name was Gaelicized as "Bareid". The former is regarded as Norman-French, deriving from the old French male given name Baraud, ultimately from the Germanic Ber(n)wald, composed of the elements "ber(n)", bear, plus "wald", rule. The latter is Anglo-Saxon having its origins in the old English Beornheard or the old German Bernhard, personal names composed of the elements "ber(n)", bear, plus "hard", brave, strong. 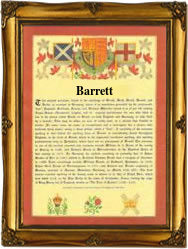 Eventually, the surname was spelt Barrett in both Munster and Connacht and the county Cork family were influential enough to give their name to an extensive territory i.e., Barrett's Country. The North Mayo Barretts were Lords of Tirawley and the chief of this sept (founded on the Irish model) was known as MacWattin. The names of several of the Mayo Barretts are included in the "Composition Book of Connacht", dated 1585. Richard Barrett, (circa 1740 - 1818), known as "the Poet of Erris" was also a prominent United Irishman. The first recorded spelling of the family name is shown to be that of Baireid, which was dated circa 1350, "The Annals of Connacht", during the reign of King Edward 111 of England, "The Father of the Navy", 1327 - 1377. Surnames became necessary when governments introduced personal taxation. In England this was known as Poll Tax. Throughout the centuries, surnames in every country have continued to "develop" often leading to astonishing variants of the original spelling.